Bugbear Entertainment, creators of the popular racing game series Flatout has launched a Kickstarter campaign to raise funds for their latest racing game dubbed “Next Car Game.”Much like their previous titles this game is also a demolition racing game. Next Car Game is all about wrecking and destroying cars. 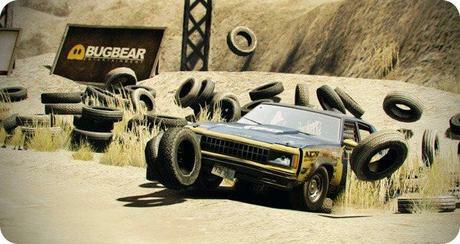 The game features demolition derbies, track races and also allows users to customize their cars and store them in a garage. There’s also “the signature once-in-the-lifetime moments that can be achieved only with true-to-life physics simulation.” The game physics seems to be also improved to provide us with a realistic feeling of the destruction. If you liked playing Flatout 2, there’s no reason to dislike this one. The developer team plans to launch the game on PCs first and hopefully for next-gen consoles, depending on how this campaign goes. The main idea behind this Kickstarter campaign is to make the game even better and improve the gameplay the way gamers want it to be. Although, Bugbear team says they will release the game even if this campaign goes down the dumpster.